We’re big fans of netting fruit trees, because as you’ve probably experienced if you’re trying to grow fruit in the same habitat as birds, possums, rats and all manner of animals who like to eat fruit (kangaroos, anyone? ), if you don’t net, there’s a pretty good chance something else will beat you to the fruit. So, you’ve followed our advice and put out your nets in spring or early summer, you’ve picked your wildly successful fruit crop, and now it’s time to put the nets away. Mend the nets. By the end of the season nets have often been damaged by kangaroos, birds or other misadventure, and mending them is often easiest to do while they’re still on the trees, when you can see the holes easily and get to them for easy mending. We use polypropylene fishing net mending twine and special needles, but anything will do – baling twine, clips, cable ties, even twist-ties can be useful. Remove nets from the trees. If you’re removing drape netting and are a little height-challenged you may need to borrow a tall friend or two, or find a nice long pole (or a broom!) to help you to push the nets up and over the tree. 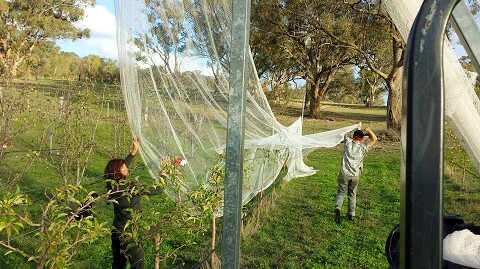 If you’re removing the nets while the trees still have leaves (highly recommended, it’s much easier), you may be able to remove the net by pulling from one side and hoping it slides off the tree, and of course if you’re removing nets from a frame it’s much easier as the net will usually just slide over the frame. Be as careful as possible to prevent breaking limbs and laterals, and particularly careful of the more delicate growing tips of the branches. Remove debris. Any twigs or branches that have become entangled, or any fruit that has become caught in the net, must be removed; the former because it makes putting them out next year a nightmare if there are snags in the net, and the latter because the fruit must be disposed of correctly so it doesn’t harbour pests or diseases. Label the net. If you’re netting multiple trees, this step makes it SO much easier next year to figure out which net goes with which tree! Pack into rodent-proof covers. Take it from us that rats and mice LOVE to live in nets in the winter, and putting out net that has been lived in by rodents is a most unpleasant and smelly job. Ideally find sealable bags or boxes that are large enough to accommodate your nets. Store out of the weather. The whole point of taking our nets in each year is to prolong their life, so it just makes sense to store them out of the weather. Sunlight is actually the most destructive element for nets (after physical damage), so if you’ve managed to do step 5 successfully and completely cover the nets you could store them outside, but they may be more prone to invasion by rodents or insects. Though it takes a bit of time to put your nets away properly, you will definitely thank yourself next season when you go to put them out again! For some help in choosing the right netting system to suit you, take our Protect Your Crop From Birds short course.